They took my breath away. I literally gasped out loud. My response surprised me. Yes, that cold December morning, I awoke in the recreation hall of the Rooterville Animal Sanctuary. It had been a lovely 2-night visit, and this was my last morning sleeping in the barn. As I pushed the screen door to go outside, I stood quietly to take in the peaceful vibe of the sanctuary. Acres and acres of green living space for rescued farm animals. My heart was so happy. Then, out of the corner of my eye, I noticed a big pig slowly emerging from the “pig side” of the barn. I slept on one side; the pigs slept on the other. We shared a sidewalk as we exited. This large pig meandered sleepily and stopped just five feet from me. I stayed statue-still. “Good morning, piggy,” I said in a soft, friendly voice. She stood there and yawned. I watched intently – because I wanted to remember this moment. It’s not often we get to wake up and share the rising sun with a farm animal. And this pig was a delightful hostess. Because just then a smaller pig emerged. I stood silently, wondering how they would greet each other. The big pig turned and walked two steps to meet the little pig. She gingerly placed her snout on the snout of the little pig. They stayed in this quiet, affectionate embrace for a solid 15 seconds. It was a caress like I have never seen before. I gasped! I really did. When I was able to breathe again, I took shallow breaths to be as quiet as possible. They slowly parted and walked into the yard together. Wow! I stood there speechless. Grateful. In tears. Right now, as I type this, I have tears in my eyes. This was a “moment.” It was a moment seldom considered by most of us. We believe that pigs are for food. We believe pigs must be dumb animals – because that is why we consider them a food source. We would never eat smart animals, would we? Well, this tender moment took my breath away. And if you had been there, you’d be speechless, too. Farmed animals have feelings. They have a community. They have joy. 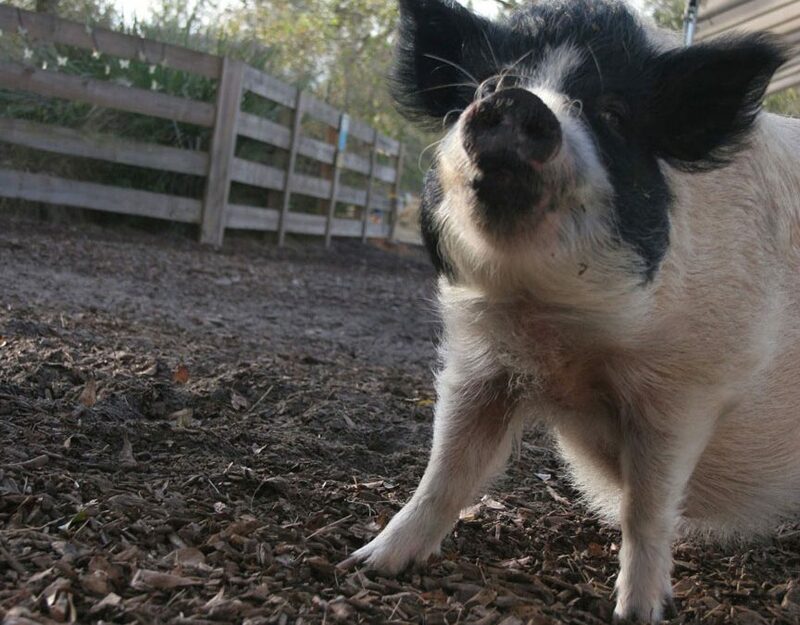 If they live in a sanctuary, they can be themselves – as nature intended. Sanctuaries give them space for their unique personalities to shine. This story is true. And I hope it touches your compassionate heart in a way that brings you insights into the marvelous world of Mother Nature – where each living being is precious. And where each living being is deserving of family, joy and free life. You may find out more about Rooterville Animal Sanctuary by clicking here.